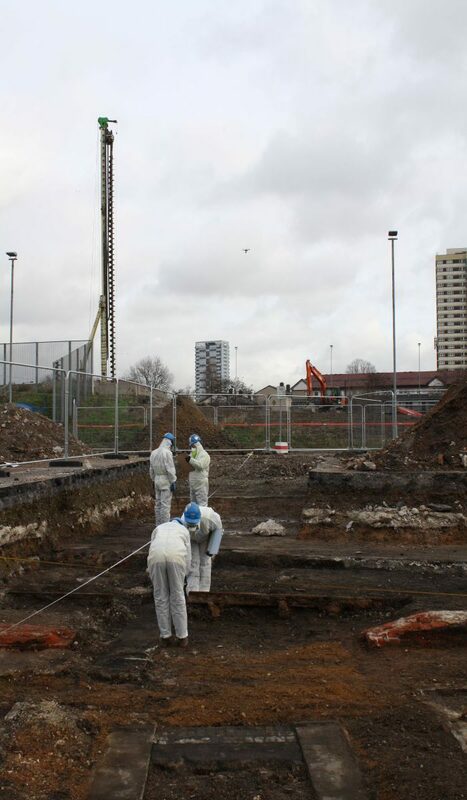 PCA was commissioned to undertake a programme of archaeological mitigation, consisting of 4 areas of excavation and a watching brief on Land at Zone 4, Chobham Farm North, Leyton Road, Stratford. PCA assesses every site in a Risk Assessment and Method Statement (RAMS) and also makes use of available Site Investigation reports. In the case of Chobham Farm, the information revealed on ground contaminants including quantities of lead which required archaeological site staff to wear appropriate PPE: disposable overalls, P3 masks, gloves. It was also assessed and stated in the RAMS that all staff were to observe strict hygiene controls (hand-washing before breaks, for example). Staff were also to remain vigilant for the presence of further ground contaminants and if suspected, these would be identified and the area cordoned off and reported to the Site Supervisor, Project Manager and Director responsible for Health and Safety. PCA staff vigilance revealed that hydrocarbon contamination was also on the site and this too was managed within the Risk Assessment as an Addendum. It was decided that appropriate mitigation for the management of the hydrocarbon contamination was that all tarmac and concrete was to be stored separately on site. All material believed to be contaminated was also stored separately. A detailed Unexploded Ordnance (UXO) survey was undertaken in order to assess the threat and risk posed by UXO on the site. The results of the survey indicated a high-risk level. Therefore, to mitigate the UXO risk, the following measures were implemented; an operational UXO risk management plan, UXO safety and awareness briefings, explosive ordnance disposal banksman support, and an intrusive magnetometer survey. PCA provided all necessary attendances required to mitigate the risk of UXO at the site. This was a continuous watching brief by a qualified explosives engineer, a site induction of all site staff by a qualified engineer, regular tool-box talks and magnetometer surveys which were required to mitigate the risk. An UXO engineer was also provided to each machine while excavating. If obvious munitions were encountered, or if an object suspected to be an explosive device was revealed, the area was to be marked and cordoned off, the site evacuated and the PCA Project Manager and emergency services notified immediately.